This is quite an invasive procedure and involves cutting through the skin, muscles, ligaments, blood vessels, nerves, bone and cartilage. The idea of doing it to puppies of such a young age was that it would be less painful. Yet, we now know that puppies, even at that very tender age, has a fully developed nervous system and research has shown that the level of pain experience may be even higher than in young or adult animals. Sadly, in the past, in an effort to save costs, some people opted to do this procedure themselves by cutting the tail off with a knife and then burning the tail to stop it from bleeding. Alternatively, some people used constrictor rubber bands which caused the bottom part of the tail to die, rot and fall off. This is actually a very painful and cruel way to remove a puppy’s tails and certainly was not a method advised or supported by vets in the past. Almost all dog breeds are born with tails and most dog breeds will have long tails, although there are some breeds which are naturally born with short tails. Dogs have tails for a reason. Two of the most prominent functional uses of the tail in the dog is for communication and for balance, The tail of a dog will in many instances, even from a distance, convey its body language. If you have a dog, think of when the dog is glad to see you when you return home in the evening after being away at work all day. Some dogs wag their tails with so much enthusiasm that their whole body moves along with it. From a dog owner’s perspective, this makes for one of the best moments of your day. Equally, if your dog is afraid, it may clutch its tail firmly between its hind legs showing its fear. If you have ever observed dogs who meet other dogs in the park you will most likely observe an upright and very active tail, communicating along with the rest of the body and face how it perceives the meeting. The longer the tail, the easier it is to read a dog’s body language. Removing the tail, in fact, to some degree, stifles the ability of dogs to communicate. If you ever have the opportunity to look at a slow-motion movie of a dog running at high speed, you will notice that its tail is being used as counterbalance when it takes a sharp corner or makes quick turns. From a posture point of view, dogs use their tails in many ways to help balance the rest of their bodies. Removing the tail may in actual fact contribute to injury because the balance of the body is changed somewhat. So if dogs’ tails are such an important part of their lives, the question arises, why was tail docking done in the past? The question following up on that is, why do vets not do it routinely anymore? In the past tail docking was an intentional procedure, requested by pet owners and mostly performed by vets and the main reason for it was because of breed standards. What do we mean when we say “breed standards”?. Over many decades, as certain dog breeds evolved, the people who bred those dogs developed a view as to what the length of this breed’s tail should be. Breeders of husky dogs preferred long bushy tails which curl around, and breeders of Boerboel dogs preferred a very short stump of a tail. The main reason given for a Boerboel to have a short tail was that a long muscular tail like that of a Boerboel whose tail has not been docked, is much more prone to damage and injury, even just when the dog wags its tail when it sees the owner or gets excited. This sounds like a sound and plausible reason, but on deeper investigation, one may find the incidence of tail trauma, is actually quite low and does not warrant this invasive procedure. One study done in the United Kingdom showed that the risk for tail injuries in dogs with intact tails is only 0,23%. This is a very low risk compared to the benefit of removing the tail completely. 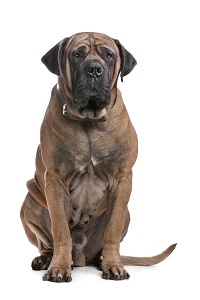 The main thing is that we just got so used to seeing that a Boerboel or Boxer dog has a short tail, that it became the breeds standard or norm, and a Boerboel with a long tail started looking strange to people before the beginning of the new millennium. So apart from this very practical argument offered as a reason to dock a dog’s tail, one wonders why else would people have started to cut dogs’ tails to a shorter length. Some investigation into the background of tail docking shows that some of the reasons offered why tail docking was done historically are that it helped prevent Rabies, strengthen dogs’ backs, increase their speed, and absurdly enough even reduced paying tax. Seems like there was a time when owners of dogs with long tails were taxed and therefore people started docking their dogs’ tails. Whether this is true or not, there seems to be a myriad of reasons why people started docking their dogs’ tails which, with the benefit of hindsight, holds absolutely no truth and has no value. Some of the more plausible reasons offered for tail docking are that it prevents injuries to dogs’ tails when used for hunting or fighting. Now if one looks at how the relationship between humans and dogs have evolved over time one can understand that at the time there may have been a case for tail docking. In previous centuries dogs were used for hunting from a subsistence perspective. People actually used their dogs to help them procure food. Jack Russel Terriers used for hunting only had half of their tails docked, unlike Boxers, where almost the whole tail was docked. The reason for leaving a longer piece of tails in Jack Russel Terriers is because when they were used for hunting rabbits and hares, their owners could pull them from a Rabbit’s hole by their tail if they managed to catch the rabbit and battled to turn around and come out of the rabbit hole with the rabbit in their mouth. In the case where the rabbit managed to get away and the Jack Russel being the hunters that they are, refused to back down and leave the one that got away and come back out of the rabbit hole, their owner could pull them out of the hole by their tail and pursue the next one. Today, very few Jack Russel Terriers are still used for hunting for food, but because we have become so accustomed to what they looked like with half a tail, this became the breed standard and the norm. This meant that as a routine, all Jack Russel Terriers had half their tail amputated, for really no reason at all. One of the other reasons offered for docking dogs’ tails is that it gave the dog an edge during dogfights. A bite to a tail is a very painful thing and during a dogfight, if the opponent manages to get hold of the tail, it can be very painful and throw a fighting dog off balance making them more vulnerable to more lethal bites. So, therefore, it was “off with the tail” to make them better fighters. Even in the previous century dog fighting was a sport attended by many and on which people bet money with fervour. Today, in most civilised countries, dog fighting is illegal and although sadly it still continues in secret, it is certainly not considered a sport anymore but rather a criminal offence. As the norms and needs of society changed, so the ways in which we treat animals have also changed. In time, people started asking the question whether it is fair to dogs to put them through this very aggressive surgical procedure for no apparent reason other than looks. Sanity prevailed and in time the various breed societies started agreeing that it was not in animal’s best interest to persist with this practice. This did not go down without major resistance from many breeders who now felt that the animals looked silly, because they no longer conformed to the breed standards that everyone became so used to. In the middle and latter part of the previous century the docking of tails by vets was advocated with the view that vets are professionals and will work in a sterile environment with the correct surgical technique and equipment, and the ability to deal with complications, should they arise. Although this is true, the uneasiness about the ethics of the procedure remained. In South Africa the docking of tail, as an ethical procedure to be done by vets, were discussed in the veterinary profession over a long period of time (decades). Eventually through much discussion, research and deliberation, the decision was taken by the profession that unless there is a justifiable medical or therapeutic reason for docking a dog’s tail, it should not be done. This means that docking a dog’s tail for aesthetic reasons should no longer be performed. The South African Veterinary Council, the governing body of the veterinary profession in South Africa, made a formal decision that as from the 1st of June 2008, it will no longer condone the routine tail docking of puppies by vets. This decision in turns means that should a vet dock puppies’ tails in the absence of a medical or therapeutic necessity, they can be prosecuted in terms of the Animal Protection Act no 71 of 1962 and may be found guilty of unprofessional conduct in terms of the Veterinary and Para-Veterinary Professions Act, 1982 as Amended. Times have changed, and vets no longer do tail docking in dogs as a routine.